FRIDAY, Nov. 11, 2016 (HealthDay News) -- Smokers have an elevated risk of dangerous aneurysms in the body's largest artery, but quitting can cut those odds, a new study confirms. Experts have long known that smoking raises the risk of abdominal aortic aneurysm -- a weak spot in the wall of the aorta, where it passes through the abdomen. The aorta is the body's main artery, and if an aneurysm there ruptures, it can cause massive internal bleeding. Researchers said the new study, because of its large size, gives a clearer picture of the risks. The investigators found that middle-aged smokers had a roughly one in nine chance of developing an abdominal aortic aneurysm in their lifetime. But if they quit during the study period, that risk declined by 29 percent, versus people who kept smoking. And longer-term quitters -- people who'd stopped smoking before the study -- had an even lower risk, the findings showed. "Quitting can substantially reduce the risk of abdominal aortic aneurysm," said lead researcher Dr. Weihong Tang, an associate professor at the University of Minnesota, in Minneapolis. "It's never too late to quit." Dr. Elizabeth Ross, a cardiologist and spokesperson for the American Heart Association, agreed. "Some people think that if they've been smoking for decades, it's too late to benefit from quitting," Ross said. But, she stressed, it's clear that when smokers kick the habit, their odds of cardiovascular disease -- not only aortic aneurysm -- go down. To Ross, the "most important" finding of the study related to women: It found that among women who kept smoking, the lifetime risk of abdominal aortic aneurysm was over 8 percent. "That's important because abdominal aortic aneurysm is often seen as a disease that affects men," Ross said. "But smoking puts both men and women at increased risk." However, it's true, she noted, that the condition is more common among men. That point is emphasized in guidelines from the U.S. Preventive Services Task Force (USPSTF), an expert medical panel that advises the federal government. The guidelines say that men aged 65 to 75 who have ever smoked should be offered a one-time screening test for abdominal aortic aneurysm. Screening can also be "considered" for men who've never smoked. For women, the picture is different. The USPSTF says there is not enough evidence to offer screening advice to women who've ever smoked. For women who have never smoked, the guidelines advise against any screening. But regardless of those guidelines, Ross said, older women who smoke can still ask their doctor about screening. Cost will be a potential obstacle, she acknowledged. Medicare pays for one-time screening of male smokers only, since it's recommended for them. On the other hand, Ross said, screening is done by ultrasound, which is fairly inexpensive -- around $100, according to the USPSTF. People can't rely on symptoms to alert them, Ross pointed out. "An abdominal aortic aneurysm usually doesn't cause symptoms until it ruptures," she said. At that point, the symptoms include severe pain in the abdomen or back, dizziness, rapid heart rate, and loss of consciousness. A ruptured aneurysm requires emergency surgery; only about one in five people survive, according to the U.S. National Institutes of Health. When an aneurysm is caught before it bursts, it may be surgically repaired or -- if it's small -- monitored with periodic ultrasounds. The new findings are based on nearly 16,000 U.S. adults aged 45 and older who were followed for more than two decades. During that time, 665 people developed an abdominal aortic aneurysm; 75 were caught through ultrasound screening that was begun toward the end of the study period, in 2011, according to the report. Overall, Tang's team found, the lifetime risk of developing an aneurysm was 2 percent for people who'd never smoked. The odds were much higher for smokers: Men had an almost 13 percent chance, while the risk was just over 8 percent for women, the study showed. Quitting clearly helped: Former smokers who'd quit before the study had about a 6 percent lifetime risk of aortic aneurysm. And those who quit in the decade after the study's start did curb their odds, compared with people who kept smoking. 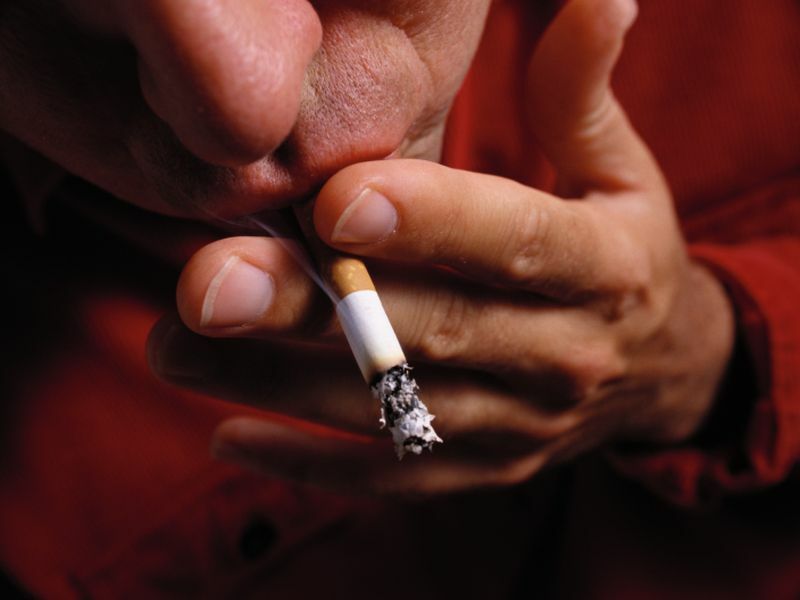 According to Tang, the findings hammer home the importance of kicking the smoking habit. As for screening, she said, this study won't change any guidelines. "Whether women can benefit from screening is beyond the scope of this study," Tang said. She agreed, however, that female smokers and their doctors may want to consider the findings when they make any decisions on screening. The results were published online Nov. 10 in the journal Arteriosclerosis, Thrombosis and Vascular Biology.